So it’s not been long since I’ve had my Brompton - it arrived in February. However, I’ve already managed to add another one to my collection! We Love Bromptons! had a 2012 Blue P6R model up for sale recently at a decent price so I ended up getting it. It wasn’t my initial plan to do so - I had been planning on touring on my hybrid this year but then when my house deal fell through, I had to move into rented accommodation quickly and wasn’t able to get anywhere where I could store a full size bike. So unfortunately, I was forced to either abandon my plans for summer or to make some changes. So I ended up getting a new Brompton and adapting my plans! The P type is the butterfly style handlebars, the 6 implies it has six gears and the R implies that the Brompton has a rack attached (as well as mudguards). 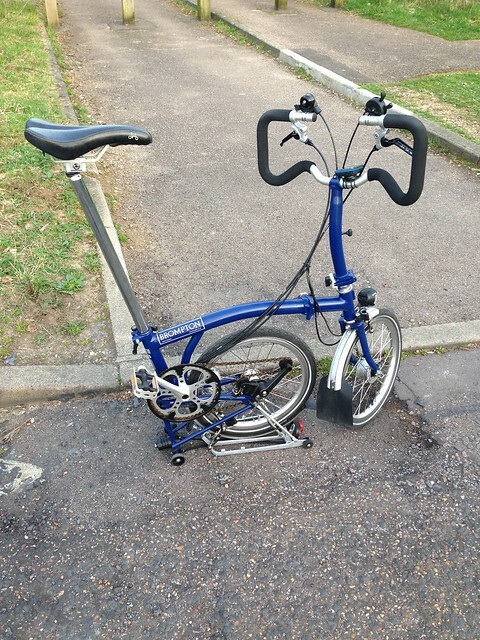 You might ask why I couldn’t simply use the existing Brompton for touring. After all, it’s a six speed model as well and the simple answer is that I bought the wrong model. Well, OK, that’s not quite true - I bought the S6L and I love it to bits. However, the S type Brompton cannot take the larger T bag that Brompton make (designed for touring, apparently) as the bag can interfere with the brakes on the S type handle bars (all other models are fine!). So, in fairness, I made the wrong choice of Brompton for touring, but for my day to day commute and for fun, the S type wins (it’s the bike I think I’ll be riding mostly with the London Brompton Club). The S is clearly the lowest handlebars (well, other than the P type where the lower bars are as low, it not slightly lower, but don’t have the brakes there to interfere with the bag when it’s mounted on the luggage block). So I could have added a rack to my S type and used the rack bag, but that didn’t seem like a good idea, it would make my daily bike heavier for no benefit during the week. Also, the rack bag isn’t as large as the T bag so I might have struggled to get everything in. Of course, I could have perhaps looked at third party solutions for the rack bag. Anyhow, I ended up getting a whole new Brompton as the P type I bought also came with a hub dynamo that I wouldn’t have minded getting, as I wanted to try and get a charger for my phone off the hub. Perhaps I might have gone for an M type (the normal Brompton bars) if I’d have found a M6R about but I wasn’t able to find one at a price I was willing to pay for a second hand model. In the end, the touring bars came out on top and when I found the second model available, I ended up splashing out. In effect, the main difference between this and my daily commute is the ability to take the larger touring back. If I’d gone for the M type, I might have been fine using it for all my days out. The benefit of hindsight. However, having two Bromptons means that I can let someone else borrow one for a ride at some point if needed and that if one ever has to go to the shop for whatever reason, I wont be bike less as I’ll be able to make use of the other. So I’ve only had to make a few changes to the P type since getting it to ensure that it’s ready to go - mainly the switch to the extended seat post. I’ve also had to add the luggage block to allow me to take the Brompton bags. I’ve also purchased the T bag, ready to go. A few extras are to come, after my learning experiences at the weekend with the Brompton riders - these are a Camelbak for on the go hydration and a spanner of some kind for punctures. The reason I got the P type was for touring. It’s first challenge will come on the 11th-13th April, where I will be planning to cycle from Loughborough (where I did my PhD) to Hatfield (where I live). I’ll be cheating somewhat and staying at a hotel on the Saturday night but it was a case of a hotel for £19 or a campsite at only just slightly cheaper. I thought I’d splash out a bit and get the hotel. Everything is pretty much all ready to go now, other than the few tools mentioned above that I’ll need in case of mechanical issues. I need to test the P type to ensure that it’s all working fine and no issues with it mechanically, otherwise I’ll be fairly stuck. I’ll be perhaps investigating some form of cycle breakdown cover. However, initial looks show that punctures don’t seem to be included by default and that seems to be the hardest part of a six speed Brompton to fix! Following the tradition started with my MTB, the new Brompton will be named following a God from the pantheon of Gods of old. The S type Brompton is Loki, as a shape changer and a God of mischief. As the P type is for touring, I’ve named it Hermes, after the messenger of the Greek Gods.